Patented system outperforms dated opposing sheet metal plate designs. Pivoting conditioning arms efficiently return solidified materials to a free-flowing state. 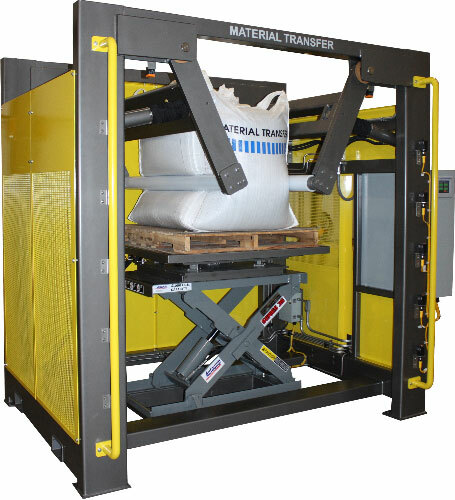 Powered rotary-lift table allows complete conditioning of a wide range of bag sizes. System offers the industries’ most robust construction and compact footprint. 116” wide x 83” deep x 102” overall height. Heavy-duty carbon steel construction with Steel-It® epoxy finish. Includes full machine guarding package. NEMA 4 carbon steel electrical enclosures. Allen-Bradley PLC with PanelView touch screen operator interface allows easy operator access to all material conditioning parameters, system status, and manual mode controls. Premium quality Parker hydraulic system with 5 HP TEFC motor.